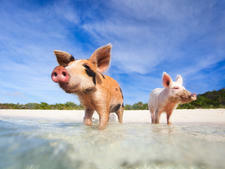 The line invested $15 million to spruce up Half Moon Cay, but just 2 percent of it has been developed. Located less than 100 miles southeast of Nassau, the island houses its passenger facilities on less than 50 acres; much of the remaining land serves as a preserve for migratory birds, with the Bonefish Lagoon on the east side of the island. A small but picturesque 20-person chapel is located on the island to host weddings and vow renewals. Day-to-day operations are handled by nearly 100 employees who reside on nearby islands. Heading into 2018, Holland America is celebrating the private island's 20th anniversary with special festivities like Caribbean-themed entertainment, a beach party with a DJ, a scavenger hunt and a brand-new children's water park. 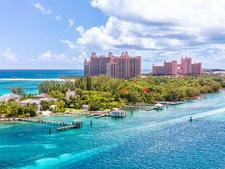 Facilities are divided into three sections: the welcome center, Bahamian Village and Tropics Restaurant. The welcome center features an information hut, restrooms, a bar, a Bahamian straw market, a post office, a first aid station, an island shop and tram stop with benches and shade. A long, covered, wooden structure equipped with misting stations has plenty of signs indicating that this is the way back to the ship. Passengers gather here to board the next tender. Ice-cold towels and water or lemonade are usually on hand while you wait. 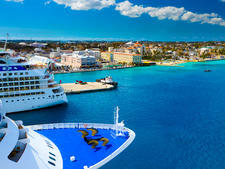 You'll pay extra for alcohol, even if you have an unlimited package booked on your ship. 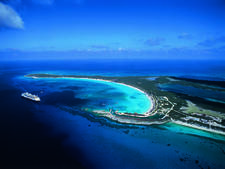 A Half Moon Cay package is available for about $25 that gets you 15 drinks for your day on shore. Passengers can rent private air-conditioned cabanas or two-story beach villas if they want to escape the crowds, but these can book quickly as there might be other ships in port at the same time. Many expenses -- such as drinks, activities and souvenirs at the line's island shop -- can be put on passengers' onboard accounts. However, for purchases at the straw market, you'll need cash. Also good to know for families with kids in tow, there is a Club HAL kids' club on the island, for parents who want to make sure their kiddos are enjoying some supervised time on shore, while they lounge one-on-one (or visit the massage cabana). On Foot: Despite the fact that Half Moon is mainly a deserted island when ships aren't in port, it's extremely hard to get lost here. Marked trails and brick pathways lead from the main square to the dining pavilion and the beach. A 5K loop (little over 3 miles) is also offered for those looking to run/walk/bike around the island. Another safe bet is walking along the flawless shoreline until you reach a quiet spot on the beach, or closer to the welcome center. By Bicycle: A 75-minute bike tour around the island is offered for about $20. It's a nice way to explore the 3-mile loop. By Tram/Golf Cart: Anyone who needs transportation around the island due to mobility issues can wait for a golf cart to transport them from the welcome center to a cabana or the dining pavilion, for example. (Transportation is included when you book an excursion, like horseback riding.) Guided tram tours of the island are offered, and last about an hour for $25 per person ($18 for children ages 4 to 12; children younger than 4 ride for free). U.S. dollars are accepted on Half Moon Cay, but unless you're buying items for cash at the straw market, be sure to have your ship card handy for purchases. Credit cards are not accepted on the island and there are no ATMs. 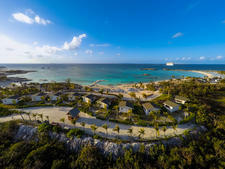 English is spoken throughout this tiny Bahamian island. 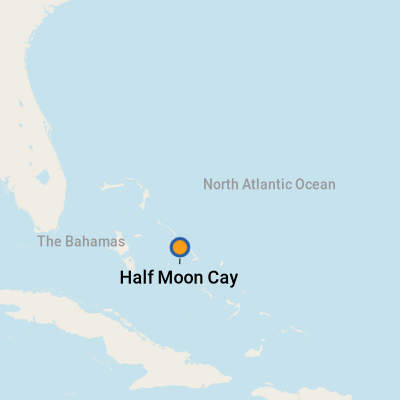 For such a small island, you have a respectable amount of dining and drinking options on Half Moon Cay. It's important to note that in order to pack up for the day, and maybe discourage anyone from lingering too long and missing on-ship time, the bars close early -- about 90 minutes before the last tender. Tropics Restaurant: Be sure to take part in the included barbecue buffet at the Tropics Restaurant, normally held from 11:30 to 1:30 p.m. Here you'll find spicy island burgers (vegetarian option available) and hot dogs, jerk chicken, guava-glazed short ribs, fish tacos, corn on the cob, baked beans, and a variety of salads from fruit to slaw and ceviche to potato salad. Fruit, bread and pastries are laid out for the taking, but a long line gathers at the single ice cream cart. Stations with ice water, iced tea and lemonade are located nearby, and plenty of shaded dining pavilions offer seating. Rumrunners Bar: This is the bar located within the Fort San Salvador welcome center, and specializes in -- you guessed it -- rum cocktails. Bell Bar: This bar is located just off the Tropics Restaurant. Many cruisers looking to enjoy their lunch with a beer or another adult beverage can be found perched on the stools here with their plates. Lobster Shack: An alternative to the main restaurant -- or for late-afternoon munchies -- the Lobster Shack offers for-fee grub like Caribbean conch and seafood chowder ($5), lobster roll ($13) or a lobster lunch with beans and rice ($20). I Wish I Could Stay Here Forever Bar: As is its namesake, this bar is perched looking out over the bustling beach, your ship and the gorgeous expanse of powder white and glowing blue. A sign which says just that makes a great photo op for those having a hard time saying goodbye to Half Moon Cay. To the right of this hut is the Lobster Shack. Captain Morgan on the Rocks Island Bar: At first this pirate ship might look like another one of the kids' playgrounds, but we guarantee you it's not. Inside you'll find a long, wraparound bar and a small staircase that leads to a second-floor lookout. Entering the island from your tender, through the Fort San Salvador entranceway, you'll see a few shops around the square, along with a market called Straw Works offering handicrafts like carvings and driftwood art, and hair braiding. Lustre is a standalone jewelry store; a generic gift shop sells items like T-shirts, keychains and sunscreen.